SEJONG -- Apartment prices in Seoul, which have continued to shoot up at since the latter half of 2016, are estimated to have hit an all-time high during the first half of 2018, causing a fears of a price bubble. 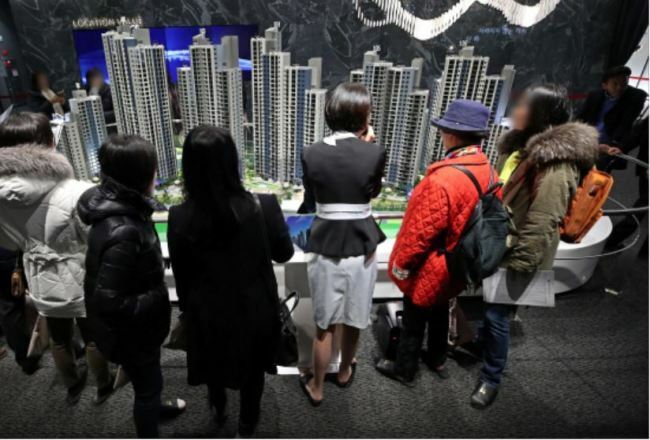 Though the government unveiled a series of measures to curb the “abnormal” housing prices, ordinary households and many property experts agree that these efforts came too late and had no effect. A normalization in Seoul’s housing market will almost certainly take a long time, as prices of some apartments in southern and central Seoul surged 500 million won ($448,000) over the past two years. Some units rose by around 1 billion won. Some apartments in the Gangnam district were thought to have traded at 80 to 90 million won per pyeong, a Korean measurement of property space equal to 3.3 square meters. These record prices produced speculations that residents in apartment complexes had formed cartels to artificially inflate the cost of their properties. In addition, some alleged other irregularities conducted by speculative investors or multiple housing owners. Now the government faces charges that weak policies from the Land Ministry, as well as the Bank of Korea’s delay to its hike in benchmark interest rates, allowed wealthy property owners to rake in huge capital gains. Property consultant Park Sang-eon picked the coming hefty taxation on multiple housing owners and holders of high-priced apartments for the main factor for investor sentiment declining since the third quarter of this year. From early 2019 the comprehensive property tax will be increased in addition to a variety of regulations that took effect in the latter half of 2018. Interest burdens are also frustrating the sentiment as the BOK raised its benchmark by 25 basis points in late November. 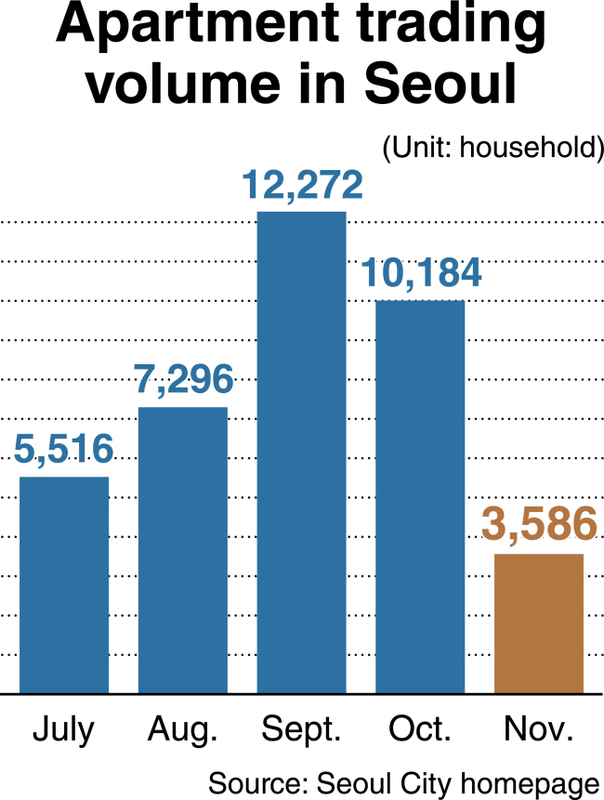 According to the real estate data from Seoul City, the monthly trading volume of apartments in Seoul stood at 3,586 in November, which is the lowest in 63 months since it recorded 3,149 in August 2013. The number is a sharp drop by more than 60 percent compared to 10,184 trading cases in October 2018 in the nation’s capital. A property agent noted that the housing market last faced a serious slowdown in 2013, after hitting the bottom during the 2008-09 financial crisis. “The figure for last November similar to that of five years ago indicates a mid or long-term downturn in sentiment and prices,” he said. A realtor in Seocho-gu, Seoul said that an apartment with 106 square meters in extent in Banpo-dong saw its prices nosedive about 500 million won from 3.8 billion won in September (according to real trading of a household) to 3.3 billion won as of early December. He predicted a continuous price drop, citing the government-led policy that is to make public the “officially assessed land value,” which could be obligatory as early as next year. The Korea Appraisal Board’s document showed that southern Seoul area has taken the initiative in prices fall. Apartment prices in Gangnam, Seocho, Songpa and Gangdong-gu posted a drop of 0.14 percent collectively in the last week of November from the previous week. Further, according to data from the Land Ministry, the number of unsold new apartments even after completion of construction is growing across the country, including in the satellite cities surrounding Seoul. The cases of unsold apartment units after completion came to 15,711 nationwide as of October, up 5 percent from 765 a month earlier. This posted the highest in 45 months though competition for newly built apartments in Seoul is still keen.